I am a mother who at first glance thought great, the Gardasil shot would protect my daughter against cervical cancer and genital warts and, I thought, with my family history of GYN-related cancers, this would be something to seriously consider. I asked our family physician her opinion on Gardasil, and while she was positive, she also cautioned that this vaccine is new and they still do not know all the ramifications of getting this vaccine. She encouraged me to do my own research on this and what I found shocked me. I came home and went online. I found this link and what I read opened my eyes yolandabarnes.vox.com/library/post/the-fine-print.html. "The study was conducted over a four-year period, which means, with such a short study, we have yet to know the extent of any adverse reactions from the vaccine, especially for the 250 girls around the age of 9 who were administered the vaccine and who have not yet reached the age where they're likely to be attempting to become pregnant. "This vaccine has purportedly been shown to protect against four types of HPV (Human papillomavirus) — 6, 11, 16, and 18. There are over 100 strains of HPV." While I do cherish my daughter's life and I would do anything to protect her, I do not know if I want to be personally responsible for her possibly not being able to have children, having some other form of cancer from the vaccine or even still contracting cervical cancer. I have sent this information and more to our state senators to consider before they pass the bill mandating this shot for school-age girls. I have pleaded with them to do more research and to seriously consider all points. This should be the choice of those for whom this shot is intended, not for someone to force them to have. I have heard back from Sen. Dave Hansen and Sen. Robert Cowles. While both have admitted that neither one of them has decided as to how he will vote on the bill, both stressed that the bill would mandate the Gardasil shot unless waived by the parent. Why have a bill to mandate if a parent can choose not to have the shot for his or her daughter? We need to be proactive in our rights and the rights of our children. I encourage you to contact your state representative's office and ask them to think about this, to do more research and to make the best decision for our daughters. Marjorie Bellow is a Green Bay resident and mother of a 13-year-old daughter. Married for 15 years, she is a certified nursing assistant at a local nursing home, religious education teacher for Annunciation, St. Jude, St. Patrick's and St. Joseph's parishes. In the short time we have been residents of Lockhart, one of the most beautiful things we have noticed about families here is the respect that children have for their parents and adults in general. Young people are courteous and well-mannered, and comport themselves with modesty and aplomb. What a shock yesterday to learn that Gov. Perry has insulted these precious children by mandating a medical procedure that presumes the young girls of Texas to be sluts. King Perry’s intrusive executive order bypassed the legislature and the proper means of enacting a new law. In a political move usually reserved for tyrants and dictators, he has unilaterally decreed that all 11- and 12- year old girls shall submit to a controversial vaccine for sexually-transmitted cervical cancer, Gardasil. Since these children are minors and depending on their parents for their protection and well-being, essentially this is an edict for all parents to surrender their children to the state for medical experimentation. As a Counselor of Natural Health, I oppose vaccines in principle. Vaccines cause an imbalance in humoral and cellular immunity, and violate the body’s God-given way of handling disease through the mucous membranes and white blood cells. With the possible exception of tetanus, no disease ever goes directly into the bloodstream—vaccines do. Vaccines contain toxic chemicals like formaldehyde, methyl mercury, MSG, foreign DNA from monkeys, rotten eggs, dogs, and yes, even lung tissue from aborted babies. Each dose of Gardasil (the full protocol requires three doses) contains 225 micrograms of aluminum, known to cause tangles of nerve fibers that can lead to Alzheimer’s disease. That’s 675 mcg aluminum just from one vaccine. Add this to the cumulative total from all the other shots, and maybe it becomes clear why the Center for Disease Control tells us that 30% of young people have chronic illness of some kind. I also oppose any form of mixing the DNA of one species and splicing it into another. This is an abomination called genetic engineering, and is supplanting the mark of God on His creation (“after their kind”) with the mark of a technological, proud beast who thinks he can wage war on the Omnipotent One with impunity. Gardasil contains genetically engineered bacteria. GE bacteria in our food has caused an unprecedented rise in allergies, asthma, and other chronic disease in children. What in the world can we expect when these mutated concoctions are injected into the bloodstream of pre-adolescent children? Prudence and common sense demand an answer before making decisions for little ones whose lives depend on us. There have already been 82 cases (read: children) of serious illness due to Gardasil since this past June reported to the Vaccine Events Reporting System. The FDA tells us that only 10% of all reactions are reported, so this means there could well be 800- 900 cases of injury. This is just short-term. Long-term consequences are immeasurable. Dr. John Martin of the Center for Complex Infectious Diseases has spent his life trying to undo the harm done by the SV40 virus from African green monkeys that was in polio vaccines given to children in the late 1950’s and early 60’s. Many of those children, mostly women in middle-age, now have autoimmune disorders like lupus, chronic fatigue syndrome, MS, and forms of mental illness heretofore unseen. As a Constitutionist, I oppose any political trumping of the separation of powers. The Founding Fathers’ brilliance of bequeathing our political system with checks and balances has never been equaled. Ben Franklin told us that they gave us a Republic, “if we can keep it.” Ambitious men like Perry should be immediately removed from office, as he has violated his oath to uphold the Constitution and our sacred heritage of rule by law. As an American, I oppose any usurping of my inalienable rights to life and liberty. Vaccines have been used worldwide as devices of population control. In the early 1990’s in Mexico, Nicaragua, and the Philippines, women (not the men, who are presumed to be more careful not to encounter rusty nails) between 12 and 49 were given tetanus shots that contained the pregnancy hormone hCG. This means that the ladies would develop antibodies to the fetus when they conceived, and a ‘spontaneous’ abortion would occur. Did these women receive full disclosure that they were submitting to sterilization when they got in line for “protection” from disease? The same good ol’ boys in the United Nations who carried out this travesty are the same ones dictating policy for our government. How do we know that Gardasil is not the “tetanus shot” for American women? As a Christian, I oppose being a victim on the altar of Pragmatism. This is the doctrine that all truth and concepts are defined by their practical consequences. Good and evil are arbitrary, because right and wrong are not constant absolutes but evolving with society. When our government does not defer to a sovereign, holy God who says that life is sacred, but to the dollars of Big Pharma, we are on a slippery slope indeed. We, our children, and all Americans become mere chattel to be used at the whim of spurious scientists and greedy politicians. Thus, the fact that Merck lost billions on the Vioxx scandal last year and is hungrily looking to appease stockholders should be weighed carefully. As a mother, I am mad as hell. How dare anyone give any kind of unproven medication to my daughter or granddaughter that could have unknown repercussions? How dare they!!! Does the state have a womb? Would the state lay down its life for my child? Even nature itself cries out against this, as most sentient beings know better than to disturb a mother bear with cubs, or a lioness, or even a dumb dog with her pups. Are American mothers, yea, even Texian mothers, less caring than brute animals? I think not, and I believe—I hope—that this political regime is going to get a good dose of maternal righteous indignation from El Paso to Port Arthur and Brownsville to Perryton. Donna Voetee and her husband have just left their native California and relocated to Texas where their children and grandchildren live. Donna believes that her son’s encounter with aplastic anemia was due to a compromised immune system due to vaccines. Donna is a Counselor of Natural Health and the author of Supermarket Survival, a series of classes she will soon be teaching in Lockhart, Texas. She can be reached at .... or at (512) 398-7800 after March 1.
. The FDA licensed Gardasil without a single case of cervical cancer being prevented. Human Papilloma Virus (HPV) alone is insufficient to cause cancer. Cervical cancer tumors which contain HPV are easier to cure than tumors not containing HPV. Cervical cancer is almost 100% preventable with simple lifestyle choices of diet and avoiding toxic chemicals. Gardasil may actually increase cancers, both cervical and otherwise. The percentage who experience vaccine adverse reactions to Gardasil is higher than for other vaccines. A lead researcher in the development of the HPV vaccine has opposed giving the vaccine to young girls. Lets look at the most important of these points. What really causes cervical cancer? At current incidence rates, if one exposes 200 women to HPV, 199 will clear the virus from their system with no problems. Why does the 200th woman develop cancer, usually decades later? Typically, cervical cancer exists when the body has high levels of toxic chemistry and low levels of immune system enhancing nutrients. So the true cause of cervical cancer is not virus but instead is malnutrition aggravated by poisons. The poisons mostly come from heavy tobacco use and the use of oral contraceptives. Virtually 100% of cervical cancer is preventable by favoring more fruits and vegetables over junk food and maintaining less toxic exposure for the body. No young girl should be made to feel that her only choices are celibacy, unproven vaccinations or cancer. For those who refuse to modify their lifestyle, will the vaccine help prevent cervical cancer? In the vaccine trials, there were no cervical cancer in either the vaccinated or unvaccinated groups and no case of cervical cancer has been prevented to date by Gardasil. Yet the manufacturer alleges that the group that received the vaccine developed no cervical warts and therefore claims 100% effectiveness in preventing cervical cancer. Cancer experts agree Merck's indirect measurement is poor methodology and even worse, that targeting HPV may even be a complete mistake because cervical tumors free of HPV are more troublesome. Logically, no ingredient of the vaccine can substitute for a healthy lifestyle. Gardasil has not been tested for cancer causing potential. However, the vaccine contains an aluminum compound that has been used in both human and animal vaccines for many years. Both cats and dogs have experienced an increased incidence of cancer at their vaccine injection sites. Humans have experienced an increase of autoimmune diseases, cancer and Alzheimer's all of which are associated by some researchers with aluminum. 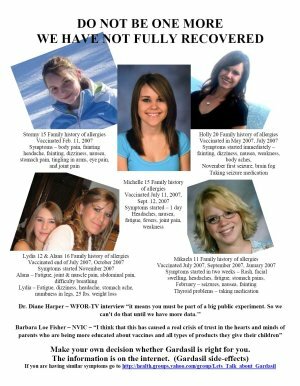 A vaccine safety Group (NVIC) has called upon the FDA and CDC to warn doctors and parents not to combine Gardasil with other vaccines and to report collapse, fainting, seizure, tingling, numbness and loss of sensation in the fingers and limbs immediately. Giving nine year old girls three shots of a toxic, potentially cancer causing compound in order to allegedly avoid a disease which peaks in women over age 40 is Snake Oil Medicine, not science. Regarding Gardasil, there is neither a moral dilemma or a scientific void, the only informed choice is to refuse the three shot series. More information on each of the above points can be found at: http://www.vaclib.org/news/2006/gardasil.htm . As a physician concerned about the welfare of my patients and preventive medicine for everyone, I found that your front page article “HPV-vaccine study flames debate” (8-22-08) fails to emphasize the two most important issues in this debate. The first is the very real potential dangers from administration of the Gardasil vaccine. Judicial Watch, a public interest group that campaigns against government corruption, uncovered documents through the Freedom of Information Act that show the US Food and Drug Administration (FDA) received reports of 10 deaths associated with Gardasil since September 2007 (about one death peer month), and 140 "serious" reports of adverse reactions, including 27 "life threatening" cases, 10 spontaneous abortions, and 6 cases of the debilitating Guillain-Barre Syndrome since January 2008. It also found 8,864 Vaccine Adverse Event Reporting System (VAERS) records associated with Gardasil, more than double the 3,461 events that had been reported with the HPV vaccine in Fall 2007. Many recipients experienced outbreaks of genital warts from the HPV vaccine. Don’t you think that parents involved in making the decision to administer the vaccine to their children should know this? The second issue is the immorality of New York State mandating parents to force their children to receive a vaccine that might kill or seriously injure them. I would be most interested in knowing about any direct or indirect financial support that Assemblywoman Amy Paulin (Democrat-Scarsdale) receives from Merck (produces Gardasil) or other pharmaceutical interests. I think this information should also be included in your article. My last concern relates to how the media in general (largely supported by pharmaceutical interests) fails to include in their articles the type of information contained in this letter. Note, if you modify this editorial for your own use, be sure to take out the phrase "I am the owner and medical director ..."